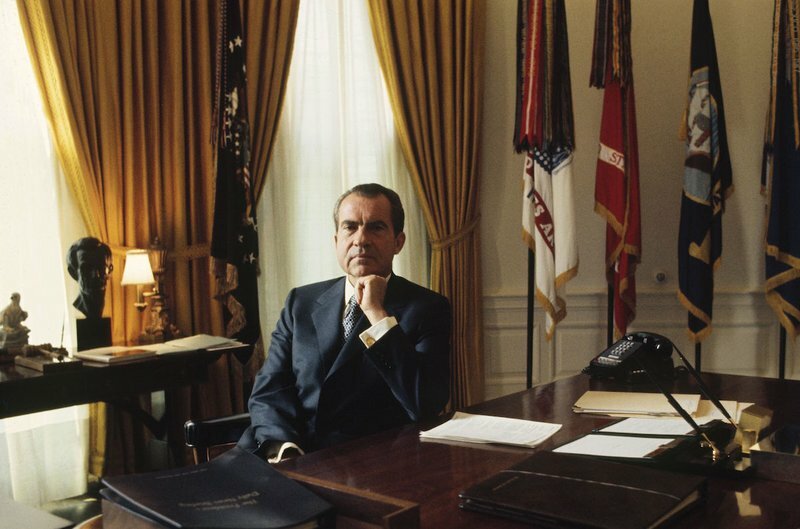 President Nixon in the White House Oval Office (Don Carl Stehhen – Gammo Rapho/Getty Images). Luke Nichter is Professor of History at Texas A&M University, Central Texas and the nation’s foremost expert on the Nixon Tapes. Why did Richard Nixon install a taping system in the White House? On this edition of the Nixon Now Podcast we explore these and other questions about the capturing of presidential history from February 1971 to July 1973. Our guest is Luke Nichter, Professor of History at Texas A&M University, Central Texas. He’s the nation’s foremost expert on the Nixon Tapes — and founder of NixonTapes.org, the only website dedicated solely to the scholarly production and dissemination of digitized Nixon tape audio and transcripts. He’s also co-editor of two volumes on the Nixon tapes with fellow historian Douglas Brinkley. In this interview, Nichter explained that Richard Nixon wasn’t the first president to tape conversations. In 1940, Franklin Delano Roosevelt installed a taping system, and manually recorded press conferences to check if he was quoted accurately by journalists, and as a way to shape the way history was ultimately written. Presidents Truman and Eisenhower recorded minimally. As technology improved in the 1960s, Presidents John F. Kennedy and Lyndon B. Johnson expanded the scope of recording conversations. Why did Richard Nixon Install a Taping System? President Nixon wanted his administration to be the best chronicled in history. However, he didn’t think it was appropriate to have note-takers in every meeting, and thought it might inhibit candid conversation. He believed some of the reports following meetings reflected inaccurate perception and were often exaggerated. President Johnson installed a taping system, in large part as a resource for his own memoirs. During the transition period after the 1968 election, he urged his successor to keep it. Two years later, Nixon installed a voice activated taping system during the period of the Lam Son 719 operation in Laos in February 1971. Other than President Nixon, only Secret Service responsible for installation and changing the tapes, Chief-of-Staff H.R. Haldeman, and White House aides Larry Higby and Alexander Butterfield knew about it. Nixon didn’t like the use of manual recording technology, because he believed conversations would only be selectively recorded. “I did not want to have to calculate whom or what or when I would tape,” he later wrote. The tapes were never referenced, and transcriptions were never made, until the revelation of their existence, and subpoenas by the Senate Watergate Committee and the special prosecutor in July 1973. President Nixon’s taping system was initially installed by Secret Service in the Oval Office. Recording devices were later installed in his office in the Executive Office Building, the Lincoln Sitting Room, and at Camp David. These devices also recorded telephone conversations. How did the Tapes Become Public? In private and public testimony, Butterfield revealed the existence of the taping system to the Senate Watergate Committee in July 1973. The Senate and the special prosecutor subpoenaed the tapes, which President Nixon contested in court on the basis that they were his personal property. In July 1974, the Supreme Court in United States v. Nixon, ruled 8-0 forcing Nixon to relinquish possession of all tapes. In 1974, the Presidential Recordings and Materials Preservation Act (PRMPA) passed Congress and was signed by President Gerald Ford. Under PRMPA, all of President Nixon’s recordings were transferred to the National Archives and Records Administration (NARA). The General Services Administration (GSA) established regulations governing the release of recordings to the general public, instructing archivists to redact information of a personal nature. In total, Nixon recorded 3,700 hours of tape, of which 3,000 hours are available to the general public. According to Nichter, the tapes allow historians to be like “a fly on the wall.” They are an unprecedented resource as they show valuable connections between traditional paper records that are often organized in silos according to subject matter and individual staff members. Most importantly, they show President Nixon’s perspective, especially on policy options he considered, and reflections following decisions. Oval 450-01. 6 February 1971. 7:56am-8:58am. Nixon, Richard and Butterfield, Alexander. Click here to read transcript. Oval 452-17. 19 February 1971. 1:39pm – Unk before 2:25pm. Nixon, Richard and Haldeman, H.R.